Cheers to another week now that Christ was reborn. Anyway, here's another Manicure Monday I have for you guys and gals. This was done with the help of a nail stamping kit from Born Pretty Store. I had mine last year and haven't used it. Good thing I started Manicure Monday and it reminded me that I have other stuff that are hiding inside my storage box. Also, I got the chance to take some photos of each step unlike my last Manicure Monday. Here it goes. 1. Paint your base coat then paint your desired color. I chose the Regular Copper Red from Caress. 2. Choose what design you want from the metal plate then cover it with a lighter color. I used Etude House Light Pink CPK001. 3. Use the scraper tool to remove the excess polish. 4. Then use the stamp to get the desired design. 5. Transfer it to your finger. Repeat steps 1-4 again on each finger. I had a hard time making each nail perfect because it's my first time to use the tool. I hope I'll get used to it more. I actually tried other designs but some are difficult to be pulled off. Lucky this flower behaves well. Excuse the dim photos since it's already dark when I finished this notd. I hope someone still likes it anyway. What can you say? Hope you can share your thoughts. xoxo. there are other designs that you can choose from sis. Cool. May mga metal plates na pala for different designs. Cute flowers. I also have a set of nail coloring and nail art things but I'm too scared to try them so I'll bring them in a salon and have the manicurist apply on me. I saw kitty there! 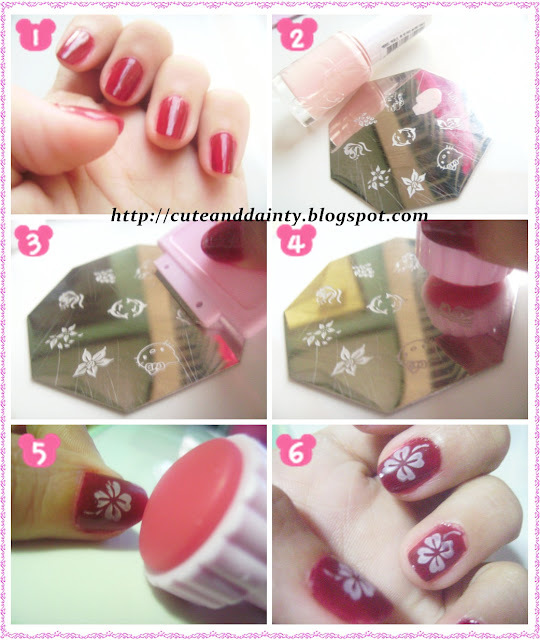 Hope to see Kitty next time on your post though flowers are occasionally used in a tutorial nail like this. My younger sisters will love this post! They do these stuff often especially when they bought new stuff in the mall. Coolness! Wooow! This is so cute! I love how your nails look very summery! That is a really nice design for a nail polish. I'm sure everybody loved seeing your nails. pretty! I love using stamp tool, it's so easy and addicting! siguro need ko pa ng madaming practice.